I am a huge fan of chicken pot pie, but frankly, I don’t make it that often because it is such a process. I pulled out my Instant Pot and got to work on creating this Instant Pot chicken pot pie casserole that gives you the same flavor as a traditional pot pie, but without all the work, and less time cooking it. Having an instant pot casserole recipe like this one, that can be whipped up in minutes versus hours to the traditional pot pie is a huge win for our household. I love having home cooked meals for my family, but I don’t always have the time. I use frozen veggies so there is no prep work of cutting them up, and they cook to the perfect consistency. Then pair with chunks of chicken, egg noodles, and a creamy sauce that brings the dish to a finish. Yes, Making Chicken Pot Pie in the middle of the summer without heating up your house sounds insane. I do not use any canned soups for this recipe. Using the Instant Pot there are so many Easy Chicken Dishes you can make like Instant Pot Beer Can Chicken or Instant Pot chicken Carbonara. Instant Pot Chicken Dishes can be made with frozen chicken or thawed with no time change. This dish has become one of my favorite chicken recipes. I like to buy larger packages of chicken or frozen when on sale, and then if it is a package I break them down so they are in portions we generally use. Then when I have an instant pot chicken recipe I am wanting, I am ready to go. Depending on the recipe I thaw it, or some I use frozen chicken which is even more of a time saver for me. You can make this instant pot chicken pot pie recipe any time of year, and never have to worry about it heating up your home. It is super fast to make, and the egg noodles give a perfect spin on a traditional dish. I highly recommend it, we love to have it year round because it is that good. Plus, it is super filling and heats up beautifully for next day leftovers. You could even make it an even faster recipe and buy a rotisserie chicken and dice it up and toss in if you don’t want to use raw chicken. Plus the rotisserie chicken will add a bit more flavor to the dish if it has any seasonings on it. I know some people love using up any leftover chicken they bought for a meal this way. Place pot on saute, Add chicken breast, spices, and olive oil. Saute about 2-3 minutes until the outside of the chicken is white. Add Egg noodles, broth, and veggies. Cook on manual high pressure for 5 minutes. Do a quick release. Stir in heavy cream. Placepot back on saute. Cook for another 2-3 minutes or until thickens. Serve. 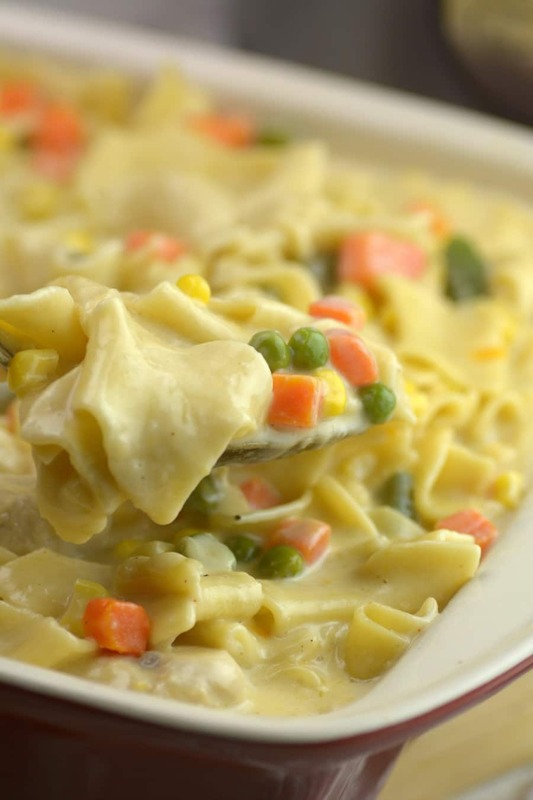 Instant Pot Chicken Potpie tastes creamy and delicious filled with veggies and bonus I do not use any canned soups for this recipe. Place your pot on saute, Add chicken, spices, and olive oil. Saute about 2-3 minutes until the outside of the chicken is white. Do a quick release. Stir in heavy cream. Cook for another 2-3 minutes or until thickens. Serve. This meal looks delicious and relatively simple to make. I would try this pot pie out. Are these just the common dried egg noodles that a variety of brands make, and they are fairly thin before cooking? Or are these the slightly thicker more “homestyle” egg noodles that are considered “specialty” and often come in straight strips? Those take longer to cook. I don’t think they are the frozen ones. Thank you for posting a great tried and true recipe!! Would it be possible to tell me the brand of egg noodles? I just received my IP and haven’t used it yet. This recipe sounds and looks delicious. I made this tonight, and it was really good. The only thing I changed was heavy cream to hakfvand half because I had it on hand. With a screaming toddler following me, this was a yummy dinner with little hands on time. It’s definitely going to be used again here! Thank you. Would whole wheat noodles work for this recipe? I’m totally new to the Instant Pot so have no idea about substituting. In my experience, whole wheat noodles come out a little mushy. Did you try it? If do, how did it turn out? I would like to make this for dinner tonight. It seems like it may yield a lot for us. Is it able to be frozen? This looks wonderful, but can it be made with something other than heavy cream? Thanks!!!! The cream is added at the end on saute m9de, so subbing it our would not alter the cooking. I substitute evaporated milk (undiluted) often for heavy cream. You mention olive oil but it’s not listed in the ingredients. How much should I use? The olive oil is listed in the first step, when adding and cooking the chicken. I used 1 TBS olive oil when I tried it tonight. It seemed like plenty. I used Farfalle Pasta rather than noodles. Not all the pasta was cooked and it seemed dry. I added an additional 3/4 cup of heavy cream and 1/4 cup 2% milk. Next time I’ll use more broth. It could be because I’m a mile high in the Denver area so things tend to be dryer. I’m going to freeze the left overs. My hubby lived it. Definitely a keeper. Thanks! Same cook time if halving the recipe? Delicious! Family UNANIMOUSLY approved and even raved about it. I used half and half and added a can of cream of chicken. I served it with flaky rolls and honey. Very satisfying meal. Thank you. When did you add the cream of chicken ? This was the very first recipe I attempted in my Instant Pot. It is SOO good! Thank you for sharing. Made this for supper tonight. 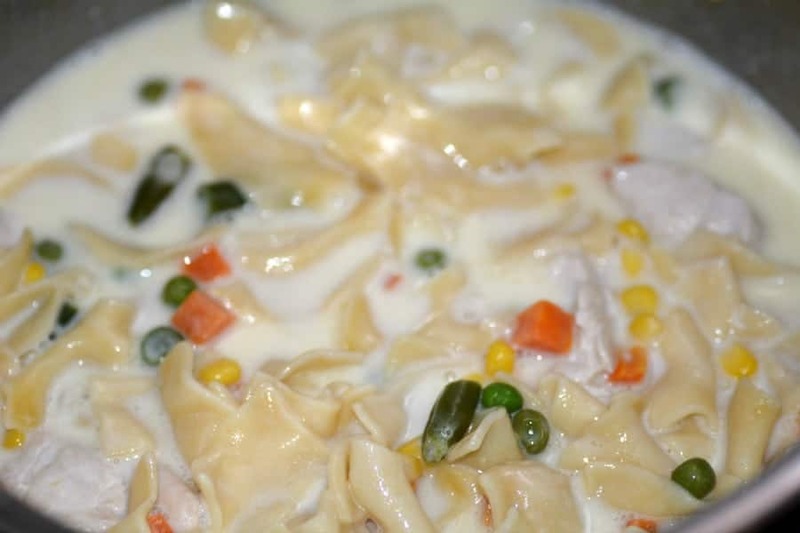 No cream, used a can of evaporated milk; used ‘better than bouillon’ chicken base dissolved for the broth; was chicken and added a Tbsp of flour to the milk and then a mixture of noodles I had on hand, and, it was delicious! I was substituting all over, and it still turned out good. We all thank you for this good basic recipe! My recipe turned out dry without sauce. I used egg noodles that were thick and 1 cup evaporated milk. Should I have added more broth or milk? Flavor great, just like more sauce. Comment welcome! Made this tonight- only cooked it on Manual pressure for 3 minute with quick release. Then stired in 1 cup 2% milk with 1 Tbsp cornstarch mixed in. Yummy. Tried this tonight.was fast an easy an delicious. Recommend this to all to try. I had frozen biscuits so I added them on top during last 5 minutes. It worked well. How much olive oil do you add to pot during sauteing? Yum. Very good. I made a few changes, based on what I had in the house. I used cream of mushroom soup, with Knorr’s Chicken Bullion, instead of the heavy cream. The rest was pretty much as written. I have no doubt the original ingredients would be just as delicious too. Thank you! Could you freeze this before cooking it? And add the cream afterwards? Good morning! Can the recipe be doubled or tripled? If so, what would the come-to-pressure and cook times be? Must the veggies be thawed before cooking? Starting this fall, I’ll be cooking dinners at church once a month for maybe 25 to 50 people, and I’m looking for affordable, simple recipes with wide appeal. I have an 8-quart Instant Pot, and I have access to two more. Thank you for your advice! I have an 8qt Instant pot and doubled the recipe just fine. I was worried, but it came out. Took awhile to get up to pressure, and release the steam (FYI). That being said, I will not double it again. I have a family of 5 and we are pretty hearty eaters, but we have enough leftovers for at least 2 more full meals with all of us eating. It makes A LOT! Do you cook the noodles prior? How many servings, do you think? I’m new to Instant Pot cooking, but this was a breeze to make. I loved it! Thanks for helping me feed my family. Can you use 2 pounds of chicken breast and keep everything else the same? Would the cook time change? How can this be cooked without a pressure cooker? Cook noodles before putting together & cook like a casserole? Than You for your help! I am gluten free. Can gluten free pasta be used in this recipe ? This was a huge hit with my family. I forgot to QR and the noodles became dumpling like. So delicious and flavorful! I’m new to this and I noticed my pot doesn’t have sauce mode. It has pressure, slow, and rice. What should I do? This is probably my favorite IP recipe to date for its simpleness, ease, and quickness from start to finish!!!! Thank you so much! This was really good! After putting servings into bowls, I added a little shredded cheese and crumbled some whole wheat Ritz crackers over the casserole, and that was a tasty addition! How do you make this recipe without a pressure cooker? I have thick egg noodles that say they need to be cooked for 20 minutes. This recipe does not require cooking noodles first? This was delicious & easy but way too many noodles for my family. Could I keep the chicken at a pound but half everything else? Would the cook time stay the same? This was so yummy! What kind of noodles could I substitute for a diabetic? I am super lazy and now make this with Trader Joe’s frozen grilled chicken strips, bag of frozen vegetables in butter sauce, box of broth and little box of shelf stable cream. Buy noodles at the regular supermarket. Cut the pepper down as a teaspoon was overpowering IMO. Love that I can have this ready to go from pantry / freezer items and we love it! Thanks. I have a cooks essentials pressure cooker. There is no “saute “ mode. Any suggestions? I’d recommend sautéing chicken on stove top first. Follow rest of directions as is in pressure cooker. Everything should be hot enough to thicken sauce when you stir in cream in your pressure cooker pot at end. Just tried this for the first time, and it’s a keeper!! It’s even boyfriend approved. ? Made this for dinner and substituted halt and half. Also didn’t use pressure cooker but a large pot with lid on med/high heat. Filled a 9×13 pyrex and placed a ready made pie crust on top. Baked on 450 15-20 with an egg wash and it was great! Thanks for the easy dinner. *recommend adding a can of cream of mushroom soup for added liquid and creaminess. I have a 8qt IP. Will cooking time change? Having made and loved this in the past I decided to try it with fresh ingredients. I finally chopped a small onion ,three cloves of garlic, two or three carrots a couple stalks of celery and pre-sliced fresh mushrooms. After browning and removing the chicken I threw in A little olive oil and lightly sauteéd the veggies, and deglazed with a dash of sherry. I did add frozen peas and used condensed milk instead of cream. It was easy and delicious! Made this tonight. Third meal in my new instant pot. Great meal! Only adjustments- 1 1/2 pounds boneless chicken thighs and one small can mushrooms. Only change I would make would to add another cup of broth or decrease noodles to 12 oz as sauce limited as made. Made enough for a small crowd! Can you freeze? This is the second recipe I’ve made in my new IP. It was very good and I am wowed by the small amount of time it took. I used sour cream in place of cream and topped it with Tobasco, yum. I’m looking forward to making it again but with more chicken and more veggies, fewer noodles. Can you make this with frozen chicken? If so how long does it cook? Delicious!!! First thing I made in my Insta Pot. Followed the directions and it is sooo good! Thanks!! This is one of our family favorites! Kid and husband approved! Thanks for sharing your recipe! Would cook time remain the same if adding potatoes? I think I sautéed the chicken a bit too long it ended up over cooked. Other than that it was delicious! Noodles were heavenly! Everyone agrees I can make this again. Thank you! Made this exactly as written and it came out perfect! Very yummy! I made pilsbury biscuits to go with, and made extra carrots on the side. This is a keeper. VERY easy. Very easy and so flavorful! I used better than bouillon and an onion seasoning blend and a sprinkle of Adobe. I tried this tonight and used Country Pasta noodles, which take longer to cook than regular pasta, so I had to improvise. The 16-oz package is huge and wouldn’t have soaked up all of the liquid. I only used about a quarter of the bag and I could have used a few more. When I set the quick release it started spewing out the liquid after about a minute so I kept closing it and letting it sit for a while before opening it again. The noodles were not quite done so I cooked them longer in the low saute setting for about 10 minutes. It looks good and can’t wait to try it. I was wondering if you could make this without putting the noodles in and maybe serving it over mashed potatoes? You may have to put a little extra thickener in it since the starch from the noodles won’t be in there. Could I use a rotisserie chicken and just skip the salting part at the beginning? This is delicious. So fast and easy. Can I make this in a presto electric pressure cooker plus? Excited to try this recipe tonight…Could I substitute a can of cream of chicken soup or a cup of milk in place of the heavy cream? I’m not a big fan of heavy cream, but want the creaminess in the noodles! Thanks! Very good and so easy to make. My family enjoyed it. I love the looks and ingredients in this recipe, but wonder how much less liquid to use if I want to omit the noodles and serve the chicken mixture over biscuits? 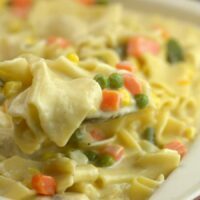 I am not exactly a traditionalist when it comes from chicken pot pie because I like to subsitute biscuits for pie crust, and your recipe sounds delicious with the noodles as part of it, but I’d love to know how you would adjust your recipe if the noodles are omitted. Thanks! I’m curios if anyone has tried this with rice instead if noodles? This recipe is delicious. The only note is that it made A LOT of food. 6 of us only ate about half of what I prepared.. Thanks so much for this recipe! I made it over the weekend and it was perfect. I sautéed some fresh garlic and a little onion while I sautéed the chicken. So excited to have a new recipe in my “Instant Pot” rotation. Yum! Made this and served with some refrigerated pie crust (unrolled, laid flat to bake, broken into smaller pieces). So good. I made this tonight and it was wonderful. Makes a lot! Next time I will make half. I used really wide thick egg noodles and get didn’t quite get done. I added a cup of water, brought it back up to pressure and cooked 2 more minutes. Stirred in cream and it was perfect! Will be using this recipe again. I also added a little thyme and summer savory. Great recipe next time I make I will only add 1/2 the noodles. Too many noodles and not enough vegi’s for me otherwise the flavor was fantastic. Stumbled upon your recipe and am going to try tonight in my IP. Will let you know. 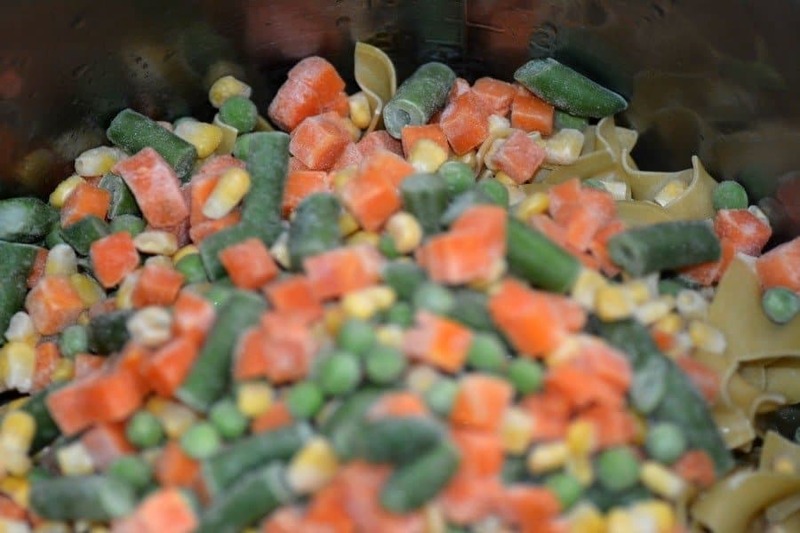 I am using frozen mixed peas and carrots – cant imagine it would make a diff, corn just sort of rubs me the wrong way in a chicken pie dish !! I will add a handful of green beans to get approx the same result without the corn. I did notice while shopping that there does not seem to exist any bag of egg noodles that is packaged in 16oz sizes. They literally are all 12oz bags, every manufacturer, I did see one specialty company there, at an insane price, but that was a 17.6oz package made from just yolks. Is it possible that the package is 12oz for the recipe and not 16oz ? My grocery store sells quite a variety of companies – Penn/Dutch, Maneshwitz, No Yolk, Prince, Barilla, Ronzoni, Pastene, and thier house brand – all 12 oz packages ! Just asking – so obviously the 12oz bag is what I am using ! Thanks for the recipe, will let you know how it goes. I’ve noticed that the store brand noodles still tend to come in 16 oz packages, while the branded ones are 12 oz these days. Made this yesterday. Egg noodle package was 12 oz. That was plenty. I added more vegetables. Otherwise followed the recipe exactly. Came out not very creamy so I would cut some of the chicken broth next time to perhaps 3 cups. It was delicious. Mine came out creamy, after letting the cream thicken using the saute’ function. But the noodles continued to cook and they became very soft. They were in good shape after cooking on high pressure etc. delicate balance between getting thickness of sauce and noodles not overcooked. Made this tonight. I’m pretty new to IP cooking. It was very delicious. I added a teaspoon of poultry seasoning and it was great. Next time I think I’d skip cutting the chicken and opt to shred it at the end. Maybe a little less noodles. My family are meat fanatics. Loving our IP, about to try your chicken pot pie recipe. Want to follow your recipes and page. I have a question about this quote from your explanation: “You could even make it an even faster recipe and buy a rotisserie chicken and dice it up and toss in if you don’t want to use raw chicken. Plus the rotisserie chicken will add a bit more flavor to the dish if it has any seasonings on it. I know some people love using up any leftover chicken they bought for a meal this way? Do you put the already cooked chicken in before cooking all of the ingredients? I was thinking that, because the chicken is already cooked , that I would put it in when the cream goes in and heat it all that way. One of my favorite recipes! I use chicken bullion instead of broth for a little extra flavor and it’s great. This is a go-to meal for us every couple of weeks. Couldn’t be easier! Are the noodles pre cooked? My husband and I love this recipe and I use it often. 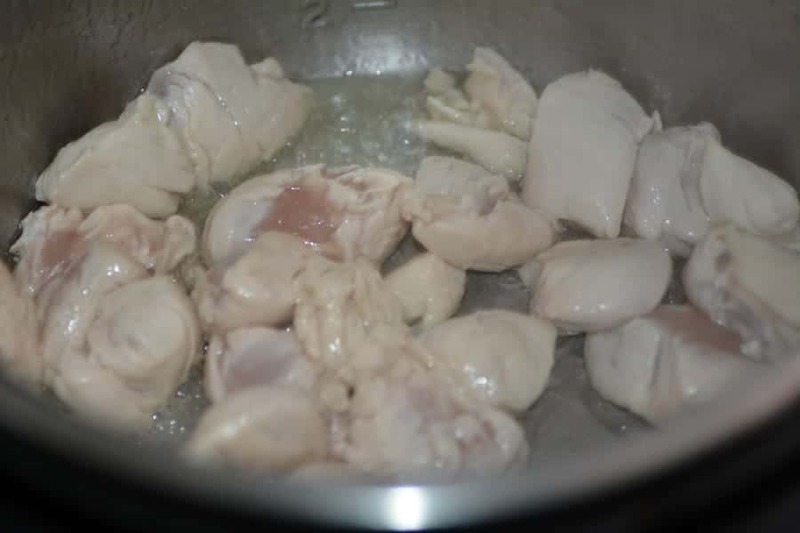 To change things up a bit I sometimes use beef stew meat cut into bite-sized pieces and substitute beef broth for the chicken broth – everything else is the same. Yummy! Making this for dinner AGAIN. My hubby loved it so I’m making it for my son and family tonight. Thank you for sharing so many wonderful recipes. Made this and loved it, will make it again but will add more veggies and only 12 oz of pasta. Looks great. Do you think this is a freezable dish? Made this tonight for dinner and it turned out absolutely delicious. I used 12 oz noodles and frozen veggies as that was what I had and it was perfect. I served it with warm buttermilk biscuits. I found this recipe last fall and I make it 2 to 3 times a month now and we love it. I have changed it a little, since it is usually just the three of us. I cut the noodles down to just 3 cups and I have started using sour cream instead of heavy cream. 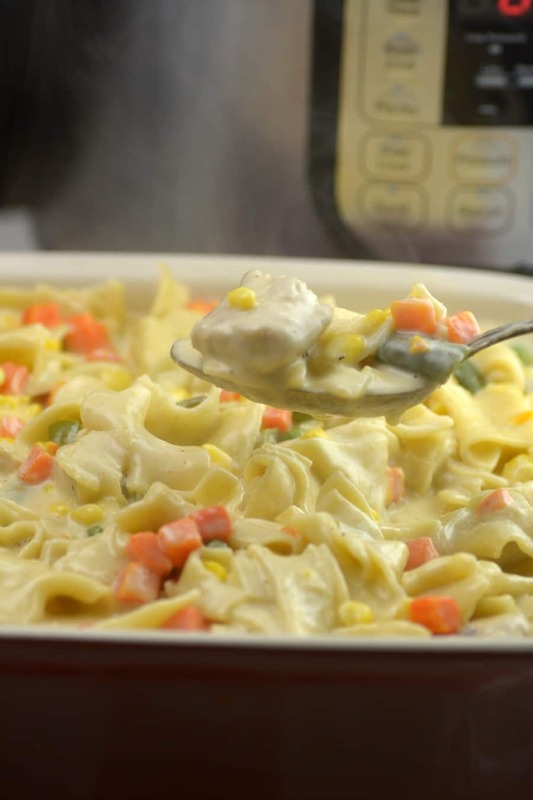 It really gives it a great taste and reminds me of my grandma’s chicken noodle casserole that way. Thank you so much for sharing this recipe. Made this tonight and seconds all around. Quite delicious and very rich. Made receipt exact except used fresh veg. Might try with half of the cream, half of the stock and more veg just for a less rich and less soupy texture. Thanks! Just made this. I cut it in half, used medium egg noodles and used chicken left over from the whole chicken I made 2 days ago in my PC. It was amazing! My oven version bakes with French fried onions on top, so I just sprinkled the onions on top after serving! Thank you for the great recipe!! Made this recipe for my maiden Instant Pot voyage… totally yummy and so easy! This kind of simple, throw everything in and go type recipe is exactly what tempted me to buy the IP in the first place. I’ll definitely be making this one again. Really good base recipe, but it is pretty bland as is. Next time I will add at least another cup of liquid. He top noodles are drier than the lower noodles when it is done, but they still got cooked completely. Definitely will add more veggies. Also highly suggest adjusting seasoning to taste. I added paprika and it was still kind of meh. I think cajun seasoning would be pretty delicious. I wish I could give the recipe a solid 3.5 stars. It’s better than 3, not quite a 4 as is. This was really delicious! The only change I will make for next time is to saute the chicken longer and only cook it for 3 minutes instead of 5. 5 minutes makes for mushy noodles. Made this last night – it was Delicious! A few minor changes/additions subbed half and half for heavy cream (what I had), added some extra frozen veg. Could it not find 12oz noodles so used that – there were plenty. Seasoned chicken prior to cooking with poultry seasoning, both garlic and onion powder. Served it with grands biscuits. Thank you! Just made this tonight and my husband and I love it. Still new to using my IP and this was an easy recipe to follow and really yummy. I used some poultry seasoning and followed the rest of the recipe step by step. Thanks, will definitely make again. Could I double this in a 6 quart instant pot? I have 2lbs if chicken off of a rotisserie chicken and the extra noodles in cupboard. Yummy! Added some fresh garlic to the recipe. It turned out great! Definitely a keeper!! I am dairy-free and gluten-free, so I used gluten-free rotini (12oz instead of 16oz after reading others’ reviews about it being too dry) and homemade cashew cream in place of the heavy cream. I had to use about 1.5 cups to make it sufficiently saucy and I added an extra .5 cup of chicken broth – it turned out amazingly well! This will definitely be going into our regular meal rotation! This was so warm and comforting. Love that there is no canned soup. This was my first time using and first time using the instant pot, and my first time making this recipe. Recipe turned out delicious! We well definitely be making this again! This was awesome! Highly recommend! Only changes I made were to use half n half, added extra ckn broth by 1/2 C. and thickened it at the end with cornstarch. My son was upset bc of no crust, so I made him crescent rolls on the side. It was amazingly good. I also used egg noodles. If I double the recipe does it need to cook double the time? I made this last night, and it came out great. Only significant change I added was I threw in a roughly chopped up white onion in with the chicken while sautéing in the oil. Oh, and the ingredients list does not seem to include the olive oil that is called out in the first step. Was easy to wing that, though. I sampled the leftovers earlier today, straight from the cold leftover bucket — very good 😛 Also, I served with Pillsbury biscuits. Okay so I made the chicken pot pie casserole recipe tonight. It really was just like chicken and noodles I make, didnt remind us of pot pie. I would revise a little when I make it next. Would add more chicken and broth as others have mentioned, mine was very dry and needed probably 2 cups more broth, which I did add when I stirred in the cream. I would also only do carrots and celery and maybe a little onion. It was kind of weird to have green beans, peas, and corn in it. But overall we all liked it! Thanks for the recipe! Great recipe. I did end up adding some corn starch and some chicken stock at the end. Mine wasn’t thickening and needed more flavor. Maybe season chicken during the sauté step at beginning. Everything cooked perfectly! This was very good had to adjust a few things like others suggested. I added two extra cups of water because it didn’t look like enough to cover everything and I didn’t want anything to burn. I didn’t have the required milk so used 2% milk and added 1TSPB of cornstarch. And of course wouldn’t you know I didn’t have enough egg noodles so substituted those with different ones. So the next time I make the recipe I will make sure I have everything on hand. OK…I just made this and it’s very tasty! I didn’t have frozen veggies, so I substituted sliced mushrooms. The only issue I have is the chicken, as small as it is, is a little chewy. Next time I may do a one or two minute NPR before the QR. I made this for dinner tonight! Fantastic! I added a chopped onion. Delicious!